expected but it does cause one to ponder. to barefoot when I was already running fast and injury free in the Nike's? which drove me back to the Evo's and Luna's. The thread devolved into a discussion of adapting to running barefoot in snow (brr...), which I think moved away from a very important point (which I tried to make in the thread, but the discussion was already digressing). Have you ever craved some food, but had no idea why? Usually it's because there's something your body needs. Ice cream and cheese? Your body likely wants calcium. A thick steak? Maybe protein. The thing is, our bodies are smarter, on an intuitive level, than our brains. Conventional wisdom says don't change what's working. But if we get our brains, our conventional wisdom, out of the way, what do our bodies say we need? For Harry, it was a more natural state. Closer to the ground. And maybe this goes back towards what I wrote a little while back about listening to that primal voice deep inside us. Maybe that voice knows a lot more about us than we 'know" about ourselves. Like what we really need. I know I've felt this tug myself. Moving toward more offroad running. A more natural state. Even my bicycling has been mainly offroad, though it's more a matter of convenience than design. And even though I'm adding some gearing to my previously single-speed mountain bike (old parts cobbled together plus an OLD tech shifter). So there's maybe something deeper that drives all of this. What got us to running in the first place? What has guided you on the journey to where you are now? now it's moved into the spiritual world. What does your spirit crave? Here's what happened: I was stupid. Okay, that's the Cliff Notes of the Reader's Digest version. What really happened is that I tried to deal with an issue by hoping it held out long enough that I could give it some down-time after hitting a goal. I've had a little niggling shin pain. By giving it just enough down time, and chopping my stride a bit, I was able to keep going for a couple weeks. But then I did something stupid, like trying to go too many days in a row, and still upping mileage. Last Wednesday I did a six-miler with Eric, and we both came away from that one hobbling (him with a calf issue, me with the shin). Thursday, it hurt to walk. Now a week later, it hasn't improved one bit. I've been limping along for six days. I went to a doctor this morning. That was an exercise in frustration. Ever had a doctor listen to half of what you say and then assume the rest? I don't know how many times I had to hold my tongue and THEN explain the rest of what I was trying to say. And I think she still got it wrong. But I got x-rays done (which was kind of my goal in the first place), which will either confirm or eliminate a stress fracture. I'm not going back to that doctor (who I'll refrain from naming, but my wife agrees with me). Ever. Unless I'm cut and bleeding and just need stitches. In other words, it'll have to be something obvious that doesn't need any explanation. Anyway... In 48 hours the x-ray results should be in. And why the heck does THAT take so long? I've been to offices where they have the x-rays on a computer screen within five minutes and they're doing the diagnosis in the same visit. If only those offices weren't 45 minutes away. And if I'd known the fiasco I was going to have to go through this morning, I'd have bit the bullet and made the drive. The location of the pain is on the front of the tibia and along the inside surface, below the attachments of the shin muscles. It's "fine" (just a dull ache) when I'm sitting or lying down, but walking, as soon as I get my knee forward of a neutral position, the pain is sharp. But I can dorsiflex my foot without weight on it just fine -- no increase in pain. Also, if I rotate my weight on my foot it gives sharp pain. Palpation gives a very localized (about two fingers width) area of pain only along the inside surface of the tibia. The brilliant doagnosis? Shin splints. Which basicallly means shin pain (the literature she sent home with me said exactly this). Um... isn't that what I said when I walked in? I'm glad insurance is picking up the tab for that bit of educated regurgitation. Next! Anyway, I'm down for the week (the good doctor said 4 weeks). If it does turn out to be a stress fracture, it'll be more like six weeks. Which will knock out the first event I'd planned at the end of March -- the Dash Point Trail Half Marathon. Oh well... There are more races. Farther in the future. I hope the day finds everyone well and surrounded by good cheer. Yesterday, I questioned my shoe geekism. I took an extra day of vacation so that I could spend the day with my wife and daughter, and we went into downtown Seattle to check out the gingerbread houses at the Sheraton, and to have lunch and play a while at Gameworks. Driving from Puyallup to Seattle, we missed the driveway to the parking garage and had to go around a couple blocks (darn one-way streets). We finally parked in the garage on the same block as Gameworks at about 12:15, and as we exited the garage I saw all these people on the sidewalk in lawn chairs, wrapped with blankets and coats. At first I thought it was some Occupy movement. 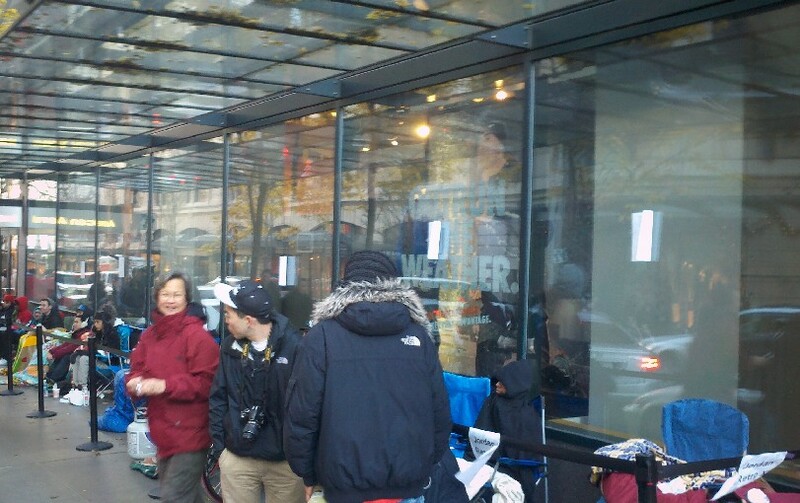 But as I got to the corner, I realized they were all in line to get into Niketown. But the store was already open. Seriously? 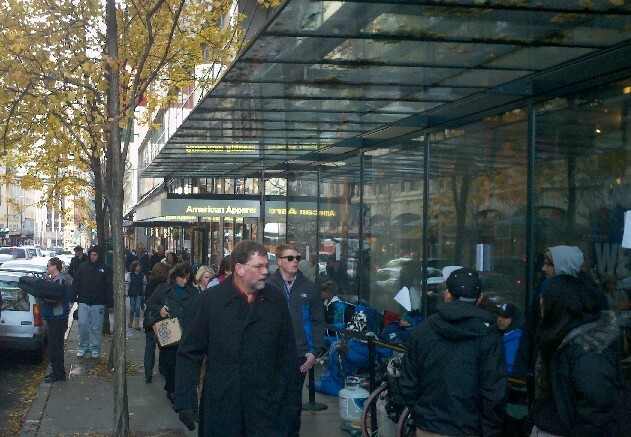 I turned around and looked back, and the line stretched as far down the block as I could see. Everyone seemed to be smiling. Or else their faces were just frozen in a grimace. Did I mention it was cold? Well, most midwesterners wouldn't think that the 37 or so at the time was "cold". I had to turn back and take a couple pictures. As I stood there with my phone poised to take the picture, I heard a van door open next to me. "Pretty crazy, huh? The line goes way down around the corner." I turned around and there were four guys in the van. They were taking a shift in the van to warm up a bit. I asked what was up. Huge grins: "Jordans. The Retro 11." "You mean you're in line to buy shoes?" At this point I knew I among a different league altogether. I had to catch up to my wife and daughter, who had gone on ahead to Gameworks to get out of the cold. We had lunch, played a while (my daughter really liked the motorcycle racing game), then went across the street to the Sheraton and went through a relatively fast-moving line to view the gingerbread displays. This year's theme must have been railroads. I liked the Island of Misfit Toys themed display, while my daughter and wife preferred the Harry Potter one. Then it was time to head home, about 3:30. They were still there. I stopped to talk to them a bit more. I met Justin, who was standing up at the time, but I recognized him as one of the gentlemen in the van earlier. He was in about 5th in line, very near the front. "We've been here since about nine," he said. "Yeah, the key is the heaters. You just can't sleep when you're all cold and shivering." I looked down and saw two large propane heaters set up about a foot from where they were sitting. Wait... SLEEP!?!?! "You mean you've been here since 9 yesterday?" I was dumbfounded. And after all that, they still had another eight hours plus before the store would re-open just for this introduction. I looked over at their van, still parked in the same place. "So that's your van there? Do you have to move it every once in a while?" "Naw, the police kind of look the other way." One of the other gentlemen whom I also recognized from the van earlier was there as well. "Yeah, they posted all these rules this time. Last time it was a huge mess, and they handed out numbered wrist bands and sent people away to come back later. This is much better." I shook their hands and wished them well, and we went on our way to check out the Clam Lights at Coulon Park in Renton. 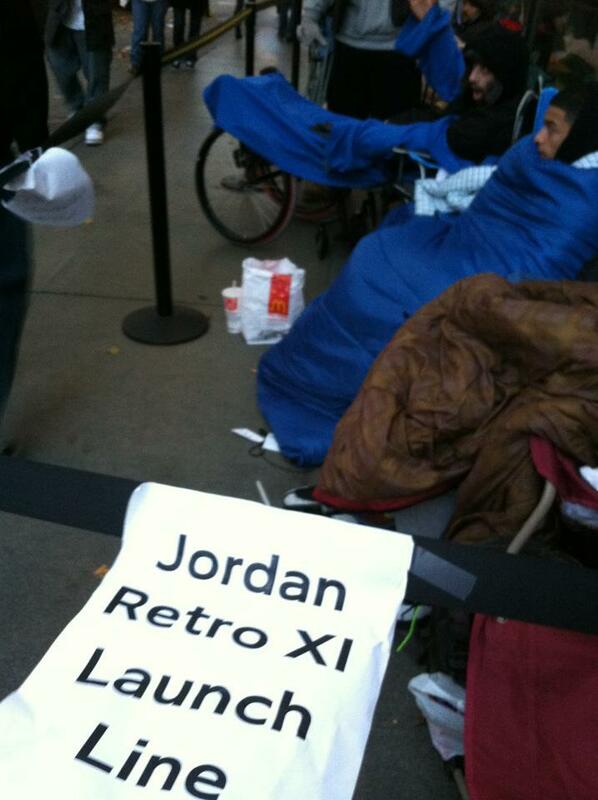 So at midnight last night, they'd finally get their chance to buy up to two pair of Jordan Retro 11 basketball shoes. Think we'll see lines at REI when the new Merrell Barefoot Road Glove arrives? Or maybe at the Born to Run store when the New Balance Zero line comes out? Midnight openings? Hey Justin, I hope they had your size. Some recent posts on other blogs has me a little concerned at the direction that some of the "more minimal" shoe genre products and advocates are taking. Yesterday's post by Jason Robillard on the Barefoot Running University site was an absolutist stab at running form, telling runners to "stay off your damn heels". That's one loaded headline, and I think undermines his intent. In his post, he fails to make the distinction between overstriding and heel striking, something that has been discussed in depth and often on BeginnerTriathlete. Jason later admits in a follow-up comment that (1) it isn't heel striking by itself that causes injury, and (2) the whole point of the headline and post was to be "impactful", regardless of factual evidence and, I feel, BAD advice. Jay Dichary has shown in studies that a heel strike in an otherwise non-overstriding running stride yields an impact profile similar to that of a forefoot or midfoot strike. In other words, the detrimental characteristic is where the foot contacts the ground relative to the body, NOT what part of the foot first makes contact with the ground. In Jason's effort to be "impactful", he gave bad advice by telling one to STAY off the heels. Recipe for calf and achilles injuries, that is. The other issue I saw was Byron Powell's review of the Salomon S-Lab Sense (a misnomer if I've ever seen one) trail shoe. He describes the shoe made for Kilian Jornet by Salomon... 4mm drop, light weight, rock protection, sockless-running build... It all sounds great. In fact, it sounds a lot like many other shoes already on the market. Then the kicker -- $200 projected retail price. What? $200?!?!? What makes this shoe TWICE as good as anything already on the market? I'm already having a hard time swallowing $100 for shoes that actually are... less. I don't buy the whole "research" costs. I believe that the shoe costs as much as they do simply because people are willing to pay that much. I think Skechers did a very smart thing by slotting their GoRun model at $80, the bottom of the minimalist shoe market range. So I see these as troubling directions. Giving bad advice in the name of making an impact... sure, that's going to make an impact. One that will be detrimental to the movement. And pricing the footwear in the financial stratosphere isn't going to do anything to lure runners into giving more minimal shoes a try. I'll start by saying that I've done yoga before. Quite a bit, actually. But... I've never done a class. Yup, self-taught, from books and videos. Most of my yoga has been done in silence and with no witnesses. And it's been a while since I did it with any regularity. My wife found a coupon for "30 days for $10" at Hot Yoga at The Edge near South Hill Mall in Puyallup, WA. This facility used to be a Bally Total Fitness before it went under (and I used to have a membership there so I could use the pool). Now it's a training center with a room for hot yoga. We were going to go on Wednesday, but a hob-nobbing opportunity for Lucky Cause Sports came up, which netted us a free dinner, so we rescheduled. I looked at their website, and was a little perplexed. They offered two types of sessions -- 90 minute hatha, and 60 minute "fusion". I thought "hatha" was the basic form of yoga from which all the others spring, and hot yoga is Bikram.However, this is not the case . "Fusion" is a more vigorous, more strenuous workout, but shorter. We went for the 4:30 hour-long session of fusion yoga, arriving about 45 minutes before the class so we could sign our lives away and agree to not blame them if we keeled over. We were told we could go in the room and get set up first, which we did. Now "hot" really is HOT. The room temperature is kept in a range of 98-105 degrees, and then they add steam. We were in the room for a while before class started, and I was just laying there, "letting the warmth soak into my muscles." Yeah, right. I was trying not to break into a sweat before we started. The instructor came in and said, "All right you guys... Well, guys and ladies." It was then that I realized I was the only "guys" in the room. Guys, listen up: that may sound like a "target rich environment", but please, this is NOT the place. Really. Trust me on this. You'll thank me later. We started with some basic mountain pose, then swiftly moved on to sun salutations (a little different than I learned, but they do vary). My wife, who had never done any yoga before, was a little lost. There was no real "instruction" in this class, you were just expected to watch and try. Very quickly I was sweating. Most people who read my blatherings are runners of some sort, I would guess, and we know we're conditioned to sweat. It just happens as a byproduct of exercise, right? Well, I think I was the only one in the room with a constant "drip, drip" going on. Punctuated with occasional streams. Downward-facing dog was transitioning into full-extension push-ups as my hands and feet slowly slid on my sweat-slicked mat. I had to stop fairly often to try to dry them off. Note to self -- bring a bigger towel next time. I did most of the routine, and what I found was that I was having to increase the rate of my breathing to keep up with the pace of the movements. For those who don't know, the breathing and the movements go together -- inhale when the movement opens the chest and abdomen, exhale when they're contracting. I think I would have liked a slower pace better. At the end of the hour, we quietly shuffled out of the room. I lugged my now-five-pound towel... When we went outside, what had been "brrrr..." when we got there became "this feels nice" on the way out. We went home and had dinner. And by 7:30 we were both ready to knock off for the night. This morning... Yeah, I'm sore. I expected that. And dehydrated. I expected that too. Leaning over to grab the dogs' bowls this morning was an exercise in pain management. And I want a tall cold drink. And another. Running is one of those things where all your senses are involved. Sight (watch where you're going! ), feel (feeling the ground, feeling pain), taste (one of my favorite responses to "how fast do I run a 5K?" is "you know when you're going fast enough, you can taste it"), smell (that amonia smell? that's muscle breakdown). But hearing... Hearing is the one that I think is almost as involved as sight. I hear the taps of my feet as they make contact with the ground (something I constantly work on lessening), the crunch of gravel underfoot. My breathing. I hear cars approaching from behind. I hear wind in the trees, the snap of a stick. Some of these sounds change with the seasons. Damp dirt in the fall and spring makes almost no sound (unless it's the splash of puddles). Hard-baked dirt in the summer makes more noise as I land. Snow depends on the temperature -- if it's cold enough, it squeaks. When I take my dogs with me on a run, I hear the padding of their feet, the soft clicks of their claws on pavement, the jangle of their tags. I hear Duke's breathing long before I hear Jake's. Yes, there are all kinds of external noises happening all the time when running. One of the reasons I like running off-road more and more is the nature of the sounds. As in, "nature" rather than man-made. But what about the things you hear on the inside? What do you hear when you unplug the iPod, tune out the cars and wind, and listen to what's happening inside you? Quiet the self-talk. Quiet the worries about work, money, children. In yoga, there's the practice of acknowledging those thoughts that come into your head, then letting them go. Do that. And listen. Do you hear it? It's something that both accompanies and dictates the rhythm of your running. Not your cadence, not that magical but arbitrary "180" that so many people are striving to achieve. It's something like a song, but not a song. It's something like a story, but not a story. Being 3/4 Norwegian, I hear it as something like the war songs of the Vikings. Both a driving force for entering battle, and a telling of a life story. It reaches down inside and pulls up something that maybe you never knew was there. And each day, each run takes something from it, and adds something to it. You'll probably know when you find it by the chills and the calm. It both excites and assuages. It makes you hungry and sates a hunger at the same time. I'm about to head out for a run. I'm taking a letter that was delivered to our house by mistake, and putting it in the right mail bow (a few streets away), then heading... not sure where yet. But I'll be listening to that inner thing. I've alluded to some coming changes in recent posts, and the time has come to reveal what's going on. It's official. Lucky Cause Sports is on its way to being a non-profit race promotion company. Last night was the first meeting of the board, with the ratifying of the needed documentation and election of officers. The next steps are to file the Articles of Incorporation with the state, and then file with the IRS for 501(C)(3) status for tax exemption. Why? We wanted to use sports, especially running and triathlon, to mutually benefit the athletes and some great causes. We have the experience of hundreds of races as participants, as well as having done the timing and race-day logistics for over 30 events in the last year, and also promoting/executing an event from conception to final accounting. We've already got two races scheduled, with registration open. We're planning on having six to seven events for 2012, and even more for 2013. We're in the process of securing sponsorship both for individual races and the entire season, our first being Nathan Sports. Our first event is on February 11th, a two-person relay where the runners start out at the same time, but in opposite directions on the course. When they meet, they do the exchange, then turn around and re-trace their steps back to the start/finish. The second is a 4K/7K on April 7th (4/7... get it?) to benefit Corner of Love, a charity that gives aid to San Ramon, Nicaragua. I know there's a lot of hard work ahead of us, but I think we have the experience and drive to make it happen. You'll see more entries on this blog updating under a new subject "RD Life", on events and such, as well as some lessons learned along the way -- things that may help you appreciate what goes into making those events happen a little more. And who knows, maybe you'll want to put on one of your own some time. If you're in the Seattle/Tacoma area, come check out the races. I'm coming up on 1000 miles running for the year. Five million two hundred eighty thousand yards. Fifteen million eight hundred forty thousand feet. Running. Does that sound impressive? I hope not. For many, that's probably only three months' worth, or maybe even less. It's not that I think that this mileage number is so huge -- it's not. In fact, I remember even in high school being in the "700 mile club", where we logged 700 miles in the time between the end of cross country season and the beginning of track season. No, I don't think that 1000 miles in a year is such a huge accomplishment. But it IS a nice round number, and since I'm so close, it's become a little bit of an obsession. Yeah, another obsession. I need one of those like I need (another) hole in the head. It's been a real joy getting to this point, though. From just two years ago thinking I wouldn't be able to run at all, to now going out for a weekend 10 (or almost 10) mile run. I'm enjoying the running more than I ever have. With only 74 miles to go as of today, which averages out to 2.84 miles a day through the end of the year, it's pretty well in the bag, assuming I don't get injured. And that's a good thing -- I'm not going to be driving myself to do something I'm not ready for in the pursuit of some relatively meaningless number. But how many times have I done just the opposite -- pushing myself to accomplish some some accumulation of miles, or some particular number of intervals, or some particular pace, to my own detriment? More than I care to count, that's for sure. Sometimes it ended before I made it to the mental finish line tape, hobbling off with my head bowed, kicking myself for displaying the absolute hubris of thinking I could accomplish such a Herculean task before I was remotely ready. Sometimes I just ran out of sand in the hourglass, the day of whatever deadline passing me by, as it always will, whether I'm prepared or not. This time, though, it crept up on me. I didn't even really notice how close I was getting until a couple weeks ago. I hadn't even looked at the yearly total. When I saw it, I thought that it was doable. I gave it a week, watching that daily-required-average slowly decrease without really having to increase my weekly mileage much at all. It still fit in with my slow increase gearing towards the half marathons next year. I figure I'll pass that 1000 mile mark some time around Christmas. Yeah, Merry Christmas to me -- I made 1K miles in 2011. Being the only runner in the extended family, I'm sure no one will ask, and I'm not going to go around bragging about it. Unless my wife forces me to. Even then I'll just sheepishly admit that, yeah, I ran that far, and no, I'm not really crazy. At least not in the clinical sense. And I'm sure I'll pass that mark well before this date next year. May all your mileposts pass as easily. I'm playing around with the look of my blog a bit -- different backgrounds, colors, layouts... But I'm keeping all the content the same. There are lots of other changes in the works as well, which I'll reveal in the coming weeks as they develop. Just about an hour ago, I finished up a conversation with Brian Beckstead from Altra Footwear. Why would I be talking directly with a shoe company like Altra? A little over a week ago, right after I had stopped by the Born to Run store and tried on the Altra Lone Peak, I sent Altra an email regarding my impressions. They were very interested in talking to me directly, mostly wanting to ferret out whether the issues were of design, or maybe a manufacturing error. Brian was in Boston, promoting the Altra line, and took time out of his schedule to call me. So imagine a shoe company that wants to talk to you directly about the issues you have with a particular shoe model. Nike has never called me about any of their shoes. Nor Brooks, New Balance, or even Merrell (though I've had public conversations with Emily Snayd on the Minimalist Runner forum). But Altra is that different, apparently, enough so that they wanted to really make sure they understood my issues. We talked about the exact pressure point I was feeling in the shoe, theorized on why it was present, and in the end both determined that there really was no issue with the shoe itself so much as it just didn't work with my particular physical make-up, specifically the shape and prominance of my 5th metatarsal. Not a big deal -- not every shoe fits every one, and the Instinct works just fine for me. I had mentioned a comment made by another shopper in the store who said that the forefoot of the Lone Peak seemed very stiff. Brian said that the rock plate and midsole do seem stiff at first, but loosen up within about 25 miles, and the shoe flexes much like the Instinct after that point. The conversation lasted maybe twenty minutes, and we talked about the shoe design, some of the changes coming up in that shoe (in particular the construction of the insole), and some coming models. He said I'd be really excited about the shoe coming out next May. I asked, "You mean the Samson?" He answered, "No, that's coming out in February. The one coming out in May, which is as-yet unnamed, will be essentially a pared down version of the Lone Peak." Hmm... A "more minimal" Lone Peak? Yes, I'm definitely interested. If you haven't seen the literature that's stuffed in the boxes of Altra shoes, then you may not know that Altra is still planning on coming out with several more models. The Samson is much like the Adam, but with laces. They also have a "more minimal" version of the Instinct in the works. So while the Lone Peak didn't work for me, as it seems I need a more pliant upper material along the outer edge, the company has one model, the Instinct, that works for me like it was custom made. And they have some exciting things in store. Well, not IN the stores. Yet. I also need to work on ensuring an easy run is easy. For me, when I'm at a 8:30 pace, for example, it's so easy to push to a 7:00-7:30 pace but I need to learn that's not the point. Yesterday, I listened to an interview of Brent Vaughn (former top runner at Univ. of Colorado and current elite runner) and he said on easy days he runs between 7:30 - 8:30 pace and this is from a guy that ran 13:18 5k back in college and debut a 1:02 half marathon. This reminded me that I have no business running 7:00 - 7:30 on easy days. I need to get back to that 8:30 - 9:30 easy running to save myself for the hard days. Brent went on to say, if you run faster than you should, then it's not an easy day and you pay later on. I did pause to hear Brent Vaughn say he ran 7:30 - 8:30 on easy days which made me laugh and ask myself, "who the heck do I think I am?" :). He went on to say that you may think a certain pace is easy and you are recovering when in fact you are not recovering b/c you are running too fast. Can you imagine a runner as talented as Brent running a 8:00 mile :) . . . so on our easy day, we could pass Brent on his easy day :) . . . now that's something to laugh about . . .
My training runs seem to hover around 8:00/mile pace, day in and day out, regardless of distance. And even when I push things up a bit, I'll drop way down to... 7:30. Yeah, that's called a rut. Sure, I race faster, and that's what race day is all about. But who the heck do I think I am running 8's on my easy day? So today I ran easy. I held back. I worked my form. I backed off even more on the downhills. The result? 8:22 pace for 4.6 miles. Wow. SOOOoooo much slower (that's sarcasm there). But along with that, I'll be doing a few harder runs that really ARE harder. Something that makes the 7:00 pace feel easier (and probably makes that 9:00 pace that much more difficult to hit). So, yeah... With true elites going 8's on their easy days, who do I think I am to be running that on MY easy days?